I’ve run away again. I’m an old woman standing in a high valley in Mongolia’s Altai Mountains. The mountain range runs from Kazakhstan to the Gobi Desert, and this particular mountainside is south of Siberia, north of China and east of Kazakhstan. The snow stinging my cheeks knows nothing of Christmas. It remembers long-haired yaks that walk into snow and wind until they find a sheltered spot close to the nomads’ yurts. Grunting softly, they settle for the night, leaning against each other for warmth. There is no sweep of easy wind and downy flake. There’s only the wind and the silence. The empty valley stretches farther than I can see, ending in grey-blue-purple peaks that blur into lavender sky. There are no roads, no fences, no farms, no boundaries, no towns—no definitions of who I am and what I can do. I could lean forward and ride all day, all week. No wonder Genghis Khan thought he could conquer the world. In Mongolia, it’s impossible not to worship the sky. Cloud shadows float across the stony grasslands and melt like bubbles on a smooth, wide river. No cloud darkens the light. The openness sings of surprise. This is where the Kazakh nomads live. There are no houses or villages. They live in soft gers of white felt, called yurts in Russian. In the summers, they load the gers onto camels and move, following their herds into high valleys for grazing. In the winter, they shelter lower, in nooks out of the wind under rocky outcrops. It’s October, and the high valleys are empty. 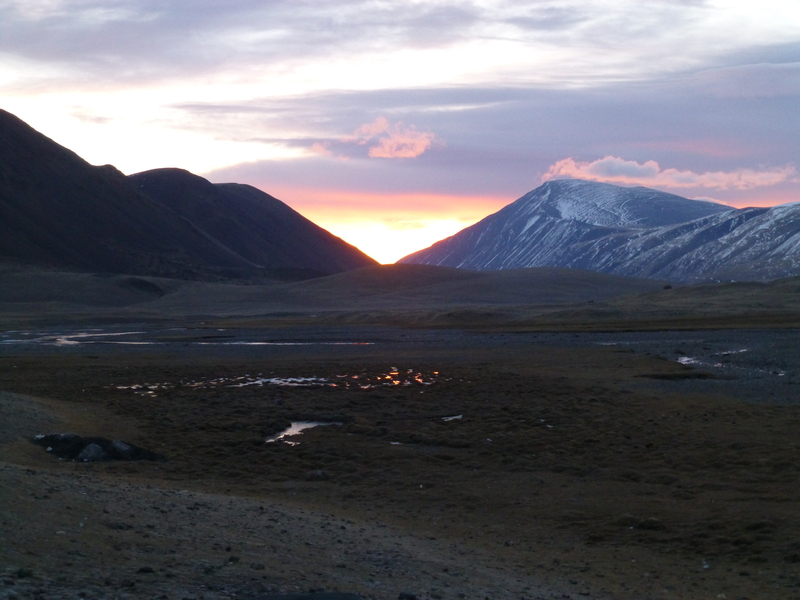 We’ve left the crude dirt roads and driven off-road for hours, following a valley near Tavan Bogd Mountain. Remote takes on a new meaning in the Altai Mountains. Even driving modern land cruisers, it takes days to get here. We flew from Ulaan Baatar to the city of Ulgii. At 8 am, we left Ulgii on a crude dirt road and drove 50 mph off-road across trackless stony valleys to arrive at our first ger camp by evening. These valleys are the free place of the Kazakhs. 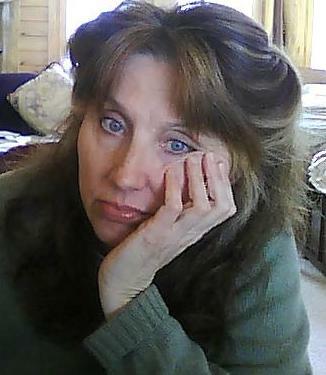 Their ancestors were the Kazakh khans of the 1460s, and their cousins are the Turks, Uigurs and Mongols. Even in medieval times, the word “Kazakh” meant someone who had thrown off a bully’s control. Some translators use the phrase “wandering steppe man” for Kazakh. In the 1800s, as part of the great game between the British and Russian empires, the Tsar’s armies seized control of the Kazakh’s land in central Asia. 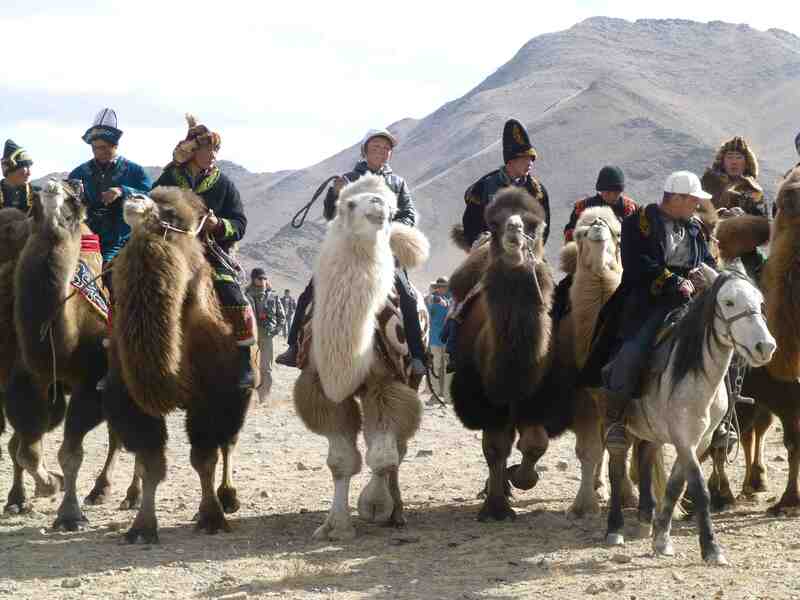 Instead of submitting, families fled with their herds to Mongolia. It must have taken months to find these empty valleys. Even then, they did not build towns. They followed their herds, moving slowly through sun and snow. I can’t stop watching the animals. They move without obedience. On these bright autumn days, horses, camels, goats, sheep, yaks and cows run free across the valleys. A flock of camels might be ten animals, but goats and sheep run together in thousands. Sometimes a nomad rides nearby to herd the animals, but usually we see no one. A herd of horses runs past. Their freedom makes me shiver. Stocky and muscular, these are gorgeous animals whose long tails stream behind them. They run like sisters who have been racing each other for years. A stallion tries to catch a filly, but she is smaller and lighter. Lithe and cheeky, she weaves and turns until he finally gives up and runs off. On the Wisconsin farms of my childhood, animals never ran free. Cows’ tails were docked to make milking easier, and veal calves were chained alone in huts. But I am in a place where there are no limits. This is the answer to my mother’s disappointment, a salve for my grandmother’s bitterness, a rebuttal to my father’s logic. In this place the only thing I have to obey is my heart and my breath. My arms lift towards the place where the mountain peaks kiss the sky. I know the place beyond, the deeper reality. This must be the utter east that C.S. Lewis describes in The Voyage of the Dawn Treader, the place where the noble mouse Reepicheep abandons his friends and paddles his coracle beyond Narnia, into the shining country where the water flows sweet. The wind and the silence sing. I remember hearing this as a child, the same yearning that Reepicheep felt. This is how I know I am near home. In 1971 I sensed it in the eyes of a Sufi in India, but I didn’t know what I was seeing. Next to me a thousand goats and sheep move up a mountainside to graze. They push together and float apart like a flock of birds soaring. Instinct moves them. There is no fence, sheep dog or shepherd. A dozen huge Bactrian camels stand motionless, the shaggy down on their chests and legs stirring in the wind. The bend of their necks speaks of caravans. Perhaps the Wise Men were Kazakhs. When we come close, the camels stare down their noses at us as if we were beggars in the bazaar and amble away. Black, beige and spotted yaks trot past, their long dreadlocks blowing in the wind. Cows amble nearby. The hybrid cow-yaks that the Kazakhs call khainag and the Tibetans call dzo have short faces and long dreadlocks. Khainags fare better on steep mountainsides than cows and give more milk than yaks and cows. We ask which milk is best. Our Kazakh guide frowns as if we aren’t quite making sense and explains that herders pour goat, sheep, yak and cow milk together. In another valley, we stay with an eagle hunter’s family. 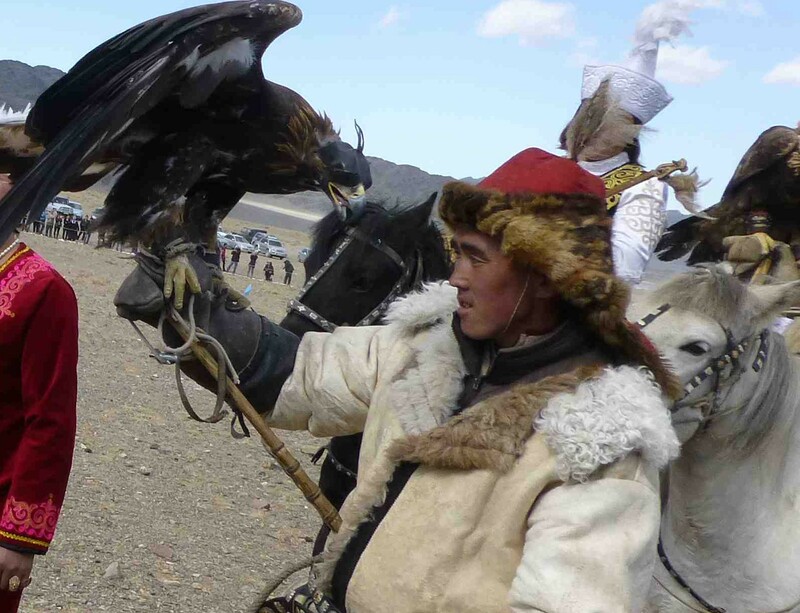 For hundreds of years, the men have captured young female golden eagles and trained them to hunt, just as our Elizabethan ancestors hunted with falcons and hawks. On a brilliant blue afternoon we go out on the mountain to hunt with the men. We’re at about 9,500 feet and the wind is harsh. We pull scarves over our faces. Today the hunters are on foot because we guests cannot ride well enough to keep up. Loose rocks cover the ground in uneven patterns. I can barely walk without stumbling. Running seems impossible. With us are two hunters. Each carries an 18-lb golden eagle on his arm. In the valley below are several beaters to scare foxes out of hiding. The hunters run down the treacherous slope and up over a ridge. They pause, squatting, watching the grey and tan slope for movement. With a shout, the hunters jump up and pull off the eagle’s leather hood. She cries out. Normally she would take off, and the hunters would race behind her. But this time, even though she senses the excitement and screams to fly free, the hunter does not see the fox and pulls her hood back on. An hour passes. We run behind the hunters, gasping, tripping and stumbling as we try to keep up. The Kazakhs dash across the treacherous slopes like children running races. It’s a brilliant moment made of high sky, mountain stones, sun, fine air, cold wind, pounding hearts and cramping muscles. Usually, the eagle dives for the fox and does battle on the ground. The trapped animals snarl and bite, and if an eagle is bitten, she may die. The hunters sprint and kneel to kill the animal quickly and keep the eagle safe. This time there is no kill. The fox hides and the eagle stays on the hunter’s arm. We run again. I can feel my shirt wet against my back. I lean over, panting. Up another slope into the sun, along a ridge, and then we wait again. We run again. Another hour passes. We squat and wait. The beaters shout again. We dash along another ridge, trying not to fall, running, stumbling. I have never felt such wild exhilaration. Far below, a beater shouts. While we were running ahead, the fox doubled back and ran like hell in the opposite direction. We’ve lost him. We come down the mountain, tired and happy. I am wet to the skin, and my legs are shaking. In all my life, there has never been such a day. The next day, at dawn, Kazakh women in bright scarves, fur vests, skirts and boots sit on milking stools among the yaks and milk the mothers, leaving the last, richest milk for the calves. The calves stay near the gers while their mothers leave for the day to graze. The nanny goats leave for the day too. By three o’clock two curly-haired kids jump and bleat in quivery desperation as they wait for the slow-moving flock on the mountainside to return. At sunset, the mothers come back. Goats and sheep nestle in a stone enclosure, and the yaks lie down on a nearby hillside. It snows, and the softness rests on them like a quilt. To enter the gers, we have to bow low. The nomads paint the wooden doors with bright blue and orange designs. Inside it’s dark and warm. Dung burns in a little metal stove in the center of the circle. The fire smells pleasant and earthy. It’s right that we bow when we enter. The valley outside is cold and bare, but inside is as warm and dark as the womb. During the daytime, when the smoke hole in the ceiling is open, the soft walls show the orange, red, grey and brown embroidery of wool wall hangings that hang above the cots. At night, before the fire dies out, we come in out of the snow and wind to climb under sleeping bags and blankets. In the black night I go to the outhouse and end up gaping like a fool at the impossible spectacle of stars. At 4 am, one of the Kazakh women steps inside and kneels to build a new fire. I watch through half-closed eyes. On the round ceiling a sunburst of branches radiates to the willow lattice of the soft walls. Firelight flickers and dances; the designs of the tapestries whirl. I think of a filly’s graceful turns and the tapping of little goat hooves. The oldness whispers, and spirits leap and jump in the orange spikes of light. I pull on clothes, pull a scarf over my face and walk out into the dawn. Behind me the yaks move quietly, and a goat bleats. I walk to the top of a hill. The horizon calls me like an angel’s song: Here is beauty. Come to beauty. Here is the edge of all you know. Come towards me. Step beyond. This is the freedom I seek. This is beauty beyond anything I have seen, a song that calls me to move beyond the last fence. Come through the very last gate. Push it open. Here in this place there are no limits. I am free to answer God’s call, so I lift my arms and sing. Jean, your words are like music, like a great opera! I caught your exhilaration and flew over the plains on my horse, face whipped by the raw wind, hooves pounding, pounding, pounding over the earth. I was a young girl again with boundless energy and like the vast sky of Mongolia, I knew no limits. I remembered the joy of how I too, like the yaks and goats and camels, once “moved without obedience” and tears came to my eyes from the happiness of this memory. Thank you! Thank you so much, Candace. Isn’t it humbling to remember when we thought there were no limits? And to realize that, in fact, there are none. 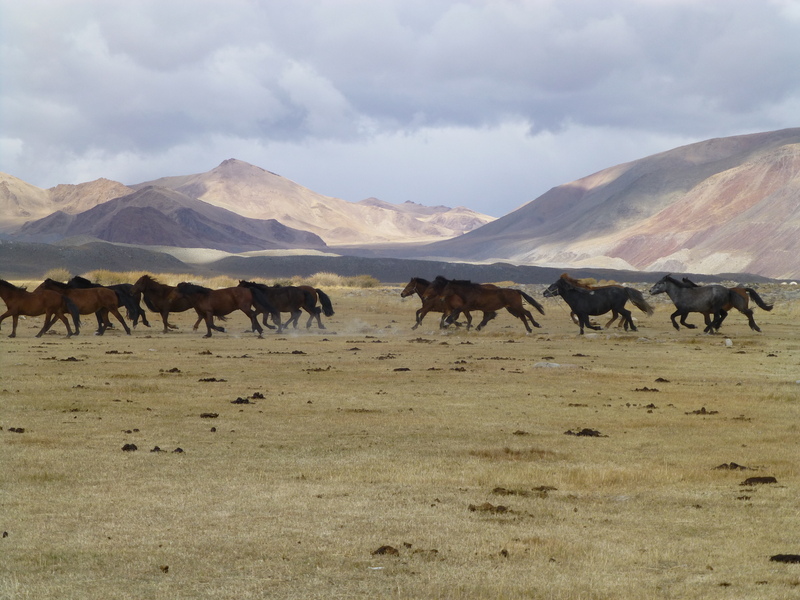 In Mongolia I could not stop watching the herds, and this is why. Yes, very humbling. I love thinking about this unlimited freedom. The earth and sky of Mongolia appear so expansive. Watching the freedom of the herds must have been mind blowing, transforming. I was going to say that I wish I could go to Mongolia some day to experience it but I think your description brought me there already! If you go, let’s go together! I love it so much there! What started me on this image was really the image of a horserace’s starting gate, where the horses are held in a position by the device that comes down over them. They can only run as fast as the device goes. Then it is lifted off, and then they start to run freely… but they have already been held in position, right? Thanks for sharing what I read as a poetic journal. Now, I know I’ll be sharing the journey with you when you revisit the steppes that dreams are made of. Thanks for sharing your memories.